Fenzi Dog Sports Academy - EasyBlog - PODCAST E106: Barbara Currier - "Getting Consistent Contacts"
Melisa Breau: This is Melissa Breau and you're listening to the Fenzi Dog Sports Podcast brought to you by the Fenzi Dog Sports Academy, an online school dedicated to providing high-quality instruction for competitive dog sports using only the most current and progressive training methods. Today we'll be talking to Barbara Currier. In 2004, Barbara and her husband Michael were relocated to Richmond, Va., where she began teaching agility at All Dog Adventures. 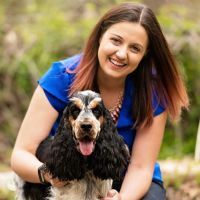 It was there that Barbara was introduced to Susan Garrett and her amazing foundation-based training, centered around impulse control and relationship-building with your dog. Along the way, she started her own in-home training and behavioral rehabilitation business. She was the trainer for Richmond Boxer Rescue and also assisted the Southeastern Virginia Golden Retriever Rescue in assessing some of their dogs. Over the years, Barbara has worked extensively with many different rescue organizations in numerous states. She has also worked as an animal wrangler for Marvel's Ant-Man, 90 Minutes in Heaven, the TV series Satisfaction, and various commercials, and is involved with the F.I.D.O Program run at Georgia Tech, which creates wearable computing for military, SAR, and service dogs. Barbara Currier: Thanks, Melissa. I always like coming to see you guys. Melissa Breau: To start us out, can you remind everyone a little bit about who you've got in the household, who your dogs are, and what you're working on with them? Barbara Currier: Sure. My oldest is Piper. She is a 10-year-old Parson Russell Terrier, and she is getting excited that dock diving season is starting back up again. She's getting in shape, ready to hit the pool with me and do that. That's the love of her life. And then I have Bliss, who is my 9-year-old Border Collie. He is retired from agility, and he does dock diving, and we actually just yesterday ventured into a new sport called cani-cross, which is running with your dog attached to a harness out in front, like a sled dog, skijoring, that type of thing. We did our first 5K yesterday and it was so much fun. Barbara Currier: Yeah. We have another one planned in two weeks, so I think that's going to be something that Bliss and I are going to delve into together. It's a lot of fun and he had a blast, so we're going to check that out. And then I have Miso. She's my 5-year-old Miniature Poodle, and she is my competitive agility dog. She's the one that I do World Team stuff with, and we go to World Team trials in May, so we are heavy into training and conditioning right now, and getting strong and doing that. So we're super-excited about that. My youngest is Eggo, and he's my year-and-a-half-year-old English Cocker. He is doing agility and knows all the obstacles. The last one we're working on right now is weave poles. He just got six straight yesterday, so I'm very proud of him. He is doing fantastic. I took him down to a winter camp recently and he just blew me away with the stuff he knew and was able to do. He's turning into quite the little agility boy. Melissa Breau: That's awesome. I look forward to seeing what he gets up to. Barbara Currier: I know! I can't wait. It's going to be really fun. I'm having a good time with him. Melissa Breau: The plan today is to talk teeters and contacts, so I want to start with the basics. Why is having a good contact behavior so important to being competitive in agility? Barbara Currier: The most obvious reason is safety. The rule in agility is they have to have one paw in the yellow, which if you look at the yellow, it's a really big space. So one paw in the yellow, even for small dogs, if that's your only criteria, it opens the door for the dogs to leap off way earlier than they should, and that's a lot of wear and tear on their bodies. So one of the main reasons is to have good independence. The contacts give you a chance to get to the next place on course that you need to be. Especially for those of us that have dogs that are way faster than we are, that pause when the dog is doing their behavior, if it's been taught completely independently, you can leave them to be doing their job while you have a chance to get down the line and get to the next place that you need to be, so that you aren't always steering the bus from behind. I personally like to steer my racecars from the front, so the contacts are one of the ways that I use to get ahead of them on course. Melissa Breau: Is all of the different contact behavior the same? Does training for one obstacle differ? Does it carry over? How do the different obstacles compare when it comes to training with contacts? Barbara Currier: The dog walk and the A-frame are kind of similar in ways. The A-frame obviously has a steeper descent, so the dog has to learn more about really shifting their weight back into their rear, so they don't get the wheelbarrow effect where their hind end comes up over their fore-end. But the basics of them, I find that the dogs transition from one to the other quite easily. The one that can be different is the teeter, especially if you have a dog that is small. Oftentimes what we do with the small dogs is we teach them a four-on, versus a two-on/two-off, because a lot of teeters have a reverb, and so when they come down and hit the ground, they will bounce back up. For the small dogs, they're not heavy enough to keep it from coming up and hitting them in the stomach, and then it makes them really leery to want to do the teeter. So we teach them a four-on versus the two-on/two-off. That can be confusing to some dogs because you want a two-on/two-off for the A-frame and the dog walk, but then the teeter comes and there's a four-on. The other thing that can happen for some dogs is if the width of the teeter and the width of the dog walk are the same. So if you have a dog that is nervous about the teeter because of the movement or the sound or whatever, oftentimes, young dogs will associate the dog walk with the same thing. So when you're seeing fear happen on the teeter, they'll think, as they're going up the dog walk, that it's the teeter, and they'll start to become a little nervous on the dog walk because they're expecting it to move, and it doesn't move, and they just keep waiting for the bottom to drop out from under them. So you'll often see there is a little bit of a correlation between fear there until they start to realize and you pair a verbal with it that the dog walk is not going to move. That's just that long, plank-y run-over and it's not going to move like the teeter does. Melissa Breau: Interesting. I hadn't really thought about how that looked from the dog's picture, and they don't always necessarily realize that they're two very different obstacles at first. Barbara Currier: Yeah. A lot of times on course — we've seen this happen at some national events — the way course design is, oftentimes if you are looking at it from the dog's point of view, and they're going up the teeter and there is a tunnel that's nearby, from the dog's vantage point it looks like the tunnel, depth-wise, is under the teeter, even though it's not. They will associate it that it must be the dog walk, and they will race up the teeter and they'll launch off the top of the teeter. We've seen it happen at national events with very experienced dogs, and you can see that they clearly thought it was the dog walk. They got to the end and they're like, "Where did the rest of the obstacle go?" Because, with the tunnel being there, it was an optical illusion for them that made them think it was the dog walk. Melissa Breau: Interesting. That's kind of crazy. Barbara Currier: Yeah. It is, it is. Melissa Breau: When it comes to consistency, I know a lot of people struggle with getting really consistent contact behaviors. Why is that? Why do you think that is? Barbara Currier: A lot of times I tell my students that dogs understand black and white. They don't really understand gray. So the more precise you are with your criteria — I expect your two back feet on the contact, your front feet on the ground, I teach a nose touch also, because the more layers in your behavior, the longer it will hold up over time. Oftentimes when people come to me and they're struggling with contacts, I'll ask them what the criteria is, and it will be really simple, like, "I just want them to get in the yellow." Well, that's really broad. I mean, you're leaving a lot up to the dog to just figure out, and therefore it's really going to deteriorate. But if you tell the dog, "I need you to do A, B, C, and D," they're like, "OK, I got this. No problem." The other thing that I see that happens at times is people will have a really good base in practice, and then they start trialing and we get bit by that "I want a cue" bug, that competitive spirit comes out, and they start releasing quickly, they let criteria slide, and then they wonder why their contacts have deteriorated. And the dogs learn how to be trial-savvy really, really quickly. They'll say to me, "My dog never breaks at home, but they can't hold their contacts in trial." Well, they've learned that at home, if they break their contact, you're going to mark it, you're going to make them do it again, there's going to be something. There's going to be some sort of repercussion that happens with that. Whereas in a trial, if they break their contacts, they technically were still in the yellow, so we still could cue. People get sucked into it and they keep running, so the dog learns, "Oh, I don't have to do that stuff here. I just do whatever I want here and I get to keep running. But at home I have to do that stuff." So they learn to be trial-savvy really, really quickly, and then it's really hard to break them of that. Also, in my opinion, I don't think it's fair to then punish your dog when you've been letting them do this all along, and now you say, "Wait a minute. Now you can't do this anymore." You really need to go back and retrain, because you let them get away with it, and so it's really on us. It's not on them. Melissa Breau: To dig into that a little bit more, if somebody had solid contacts but they are starting to se them slowly deteriorate, how do you dive into that? Where would you start to repair that behavior? Barbara Currier: Again, I look at what's happening in practice versus what's happening in trial. A lot of things happen. You either have a dog that won't even try to stop. They just come barreling down and they jump off like they have running contacts. That's usually the dog that's being let to get away with this at trials and there's no repercussions for it. They're not marking it, there's no information to the dog that that's not OK.
Then you have the dogs that creep. They get to the top of the A-frame and they come down super-slow. Or they get to the down ramp of the dog walk and they start to creep down really slow, and they stop before they get to the yellow, and stare at you, and then they creep a little more and stop. Usually that is the person that has started quick-releasing their contacts, so the dog barely gets down to the criteria of, say, the back feet on and the front feet off. They may only get to four feet right at the bottom of the contact, and the handler starts releasing early because that clock is ticking and we need to win. So they release early, so what's happening is the dog is like, "I thought I was supposed to come down here, but now you're releasing me when I get to here." So they start creeping down the ramp, going, "Are you going to release me now? What about now? How about now? Now? Now?" And the whole time the handler's going, "Touch, touch, touch." We're also behavior chaining in, "Every time my handler says 'touch,' I take another step forward." It's this volleyball game back and forth from the handler to the dog. Oftentimes I have to figure out which one it is, and usually by what the dog's doing I can figure out quickly which one it is, and then I say to the handler, "So is this what you're doing?" And … "Yes." From there, what we have to do is we have to go back to the basics. We have to teach the dog that we're only going to say their "touch" command once, and then we're going to wait them out, and that there's a ton of value at the bottom of the contact. You want to get to the bottom of the contact as fast as possible. Getting to the top of the A-frame and standing there and waiting isn't going to do anything for you. You want to drive down to that bottom. So we need to put the value back in the bottom. And then we need to be super, super consistent. We need to trial exactly how we train. If blowing your contacts at home is not allowed, well then, blowing your contacts at trials can't be allowed. It doesn't matter if you're still clean by the rules of this sport. You have to be fair to the dog and expect the same thing from them. Melissa Breau: I can probably guess at this point, but stopped versus running contacts — what do you teach, and why? Barbara Currier: I actually teach both. All my dogs have both running and both stopped on two different verbals, because oftentimes the course will have a discrimination where, at the bottom of the A-frame, say, there's a tunnel, and we're going to do a sharp right turn and flip back into the tunnel. In that particular situation, I don't necessarily want to do a running contact because I don't want my dog running straight off the A-frame, and especially if there's a jump out there, they're going to go. So that would be a place where I would want to use my stopped verbal, so that they'll come into a stop and I can just slip them into the tunnel. But in that same course it may be dog walk just to a straight-out tunnel, or something like that, where I don't want them to stop. I want them to run as hard as they can. So it's nice to have two different verbals where oftentimes in the same course I may have a stop on the A-frame or a run on dog walk or the other way around — a stop on the dog walk and a run on the A-frame. So I teach both. Also I compete at an international level, and at an international level you pretty much have to have running contacts to have any chance of being up in the top times. It's just so fast, and you really don't have a chance with stopped contacts. Melissa Breau: That's not typical, though, right? Most people don't teach both, right? Barbara Currier: At the more advanced levels, a lot of people teach both. Barbara Currier: With small dogs. With large dogs, most people usually just do running. It also depends on what your level of running is. The more of an athlete you are, the more you can deal with beating your dog on running contacts, but if you struggle with sometimes beating your dog, then either having both or having stopped contacts is a better option, because if your dog just smokes you off of a line and takes off-course obstacles because you can't be there, well, this doesn't do you any good. Melissa Breau: I know you have a class on this stuff in April. For the class, which one do you go into, or do you go into both? Barbara Currier: I do not go into both. I just teach stopped in this class. To teach running is very, very, very in-depth and there is a ton of repetitions. Actually, running contacts is harder on a dog's body than stopped contacts. A lot of people think it's the other way around, but the running contacts is all about strutting. Where stopped contacts we teach "Your back feet go here, your front feet go here," on running contacts it is a certain number of strides up, a certain number of strides down. It's very hard to see unless you've trained your eyes to see that, and you have to do the entire obstacle over and over and over and over because it becomes muscle memory for the dog. Where stopped contacts you can do a ton of training just on the bottom behavior and on a travel plank, which is no wear and tear on the dog's body. So the stopped contacts are easier on the dog's body. Also, if stopped contacts are taught properly, the dog should come down and have their weight shifted in their hind end to prevent them from coming down and having all of their weight jammed into their shoulders. A lot of people don't like stopped contacts because they think it's hard on the dog's shoulders. Well, if it's not trained properly and your dog doesn't know how to rock their weight back, it is hard on their shoulders. But that should not be the way the dogs come down. But then you also have dogs that have different structures, so you have to modify sometimes. Like, I don't particularly want a dachshund doing a two-on/two-off because of their long back. I don't want that bend in their back. So for a dachshund, we may teach them four on the ground, right at the base of the obstacle, so that they come all the way down, but they're going to stop at the very bottom. Does that make sense? Melissa Breau: Yeah, that's interesting. All four feet would actually be off the contact then, technically, at the bottom? So flat? Is that what you're saying? Melissa Breau: That's really interesting. Barbara Currier: Yeah. They're completely legal because they come right down to the yellow, but they have stopped on the ground and so their backs remain flat. With a longer-back breed, that's something that you have to think about. Also dogs that have very heavy front ends, like a lot of the Staffie breeds that are very front-end heavy. Like French Bulldogs, who basically 90 percent of their mass is in their head, you don't particularly want them doing a two-on/two-off because it's physically almost impossible for them to rock their weight back appropriately in their haunches, so you're going to get this wheelbarrow effect where they're always going to be doing a handstand at the bottom of the contact, and that's not good on their bodies, either. So sometimes with a dog's structure, we have to adjust a little bit on how we do it. Melissa Breau: The class focuses on the teeter AND contacts, right? Would you mind talking us a little bit through your approach for training with the teeter? Barbara Currier: Sure. There's a lot of things that break down the teeter because there's many elements to the teeter that cause a lot of dogs stress. There's the sound, first off. Many dogs are sound-sensitive, and the sound is a big deal to a lot of dogs. So we do sound games in the beginning to help them get really comfortable with pairing the bang with a reinforcement so that they don't feel like … we've taken away that fear of the noise. So we do a lot of that stuff. Also with the teeter, there's the motion. I often say to handlers, "Have you ever gone up the teeter?" It's really interesting. I find sometimes people get discouraged and frustrated with their dogs when they are fearful of the teeter, and so I say, "Well, have you done it?" I've done it. I've walked over the teeter, and I'll tell you: it's a little intimidating walking up this board, only knowing it's going to drop out from under you in a few seconds. And yet we want our dogs to race to the bottom and ride it down. So I really want to play a lot of games with my dogs in the beginning, so that they really enjoy that motion, and the fact that it is going to drop out from under them — that they're prepared for it and they know how to do it. So I do a lot of movement games with them, where the movement is very small to start with, and we build it up so that they're really wanting to ride it to the end. Oftentimes for the small dogs, especially … the teeter as an obstacle is a better obstacle for large dogs, obviously, because they make it tip faster. For small dogs, the tip point, even though it's supposed to be the same, it's not. On every teeter it's different, and so a lot of small dogs will learn to run to where the tip point is on the teeter that they train on the most, they'll ride down at the tip point, and they'll scootch into position at the bottom. The problem is the tip point changes from teeter to teeter, so you'll get to a trial and the dog will go to the place that they're expecting the tip to happen, and the tip won't happen, and they'll just stand there. And they're like, "It should be moving now." So what we want to train our small dogs, especially, to do is drive all the way to the end of the teeter as fast as they can, and ride the whole tip down from the very edge of the teeter, almost like it's a surfboard. That can be scary for dogs, so I like to do a lot of games with them in the beginning where I break all of these things down into really small games and teach them that these are all really fun aspects of this obstacle and really get them to love the obstacle. Melissa Breau: Can you share a little more on what else you're covering in the class? Maybe who it's for? Barbara Currier: Really, it's for anybody. It can be for the person that hasn't taught contacts yet and they want to start off on the right foot, and it can also be for someone who is having issues with their dogs. Their dog is starting to blow contacts at trials, or their dog had a scary episode happen at the teeter and now they're scared, or they fell off the A-frame and now they're scared, or they fell off the dog walk and now they're scared. So they want to go back and retrain and get the love back for the dog in that obstacle. So really, this class is for anybody. Melissa Breau: Awesome. That answers my next one, which I was going to ask you that specifically, that if a dog has had a bad experience with the equipment, could they sign up. It sounds like the answer is definitely yes. Barbara Currier: Yeah, absolutely. So many of the games in here will teach them that it's not scary. Because it happens all the time. When dogs are going across obstacles that are this narrow, at the speed that we're asking them to go across, things happen. They fall off. They think the teeter is a dog walk and they launch off the end, and that's really scary. These obstacles are pretty high off the ground. You've got some dogs that are fearless and will just jump right back on like it's nothing, and then you have other dogs that are like, "No, no, no, no. Don't want to do that again." So then we have to go, "All right, we're going to take some steps back here, and we're going to show you that this is not as terrifying as you think it is." Melissa Breau: Right, right. As a final question, what's a lesson you've learned or been reminded of recently when it comes to dog training? Barbara Currier: I would have to thank my dear little waffle for that. He has been really awesome in teaching me … he reminds me all the time, and it's something I try to always keep in mind: to train the dog that you have in front of you. He is a very bold dog, always has been. I don't ever believe he actually even went through a fear period. If he did, I never noticed it. But when it comes to training, he's incredibly soft. He doesn't fail well. If he fails, he would go off and sniff. And he didn't recover well from failing. He was just so, so soft. He doesn't like to be wrong in training, and his default is, "I'm just going to leave and go sniff." So I really had to take a look at every single training session that we did, have a strong plan when I was going out: What am I hoping he learns today? What am I going to do if he does this? How am I going to keep this short? I also found with him he didn't like to repeat things. That's very common with a lot of dogs, but we, for our benefit, need to repeat stuff so that we can get some muscle memory down too. So with him I would have to do something once, and if he was right, go do something else, and then come back and do that same thing again, so that I could get my teamwork down with him, but yet he wasn't constantly having to repeat stuff. I had to just watch him and learn his signs of "I'm getting tired," and stop before those signs started to happen. It's amazing how resilient he's become, because like I said earlier, he's learning weaves now, where a lot of failure happens with weaves, and he is handling it like a champ. He can be wrong three times in a row and he doesn't care. He's going to keep trying. I'm really thrilled with how he's developing. Melissa Breau: That's awesome. I'm glad to hear things are coming along so nicely. Melissa Breau: All right. Thank you so much for coming back on the podcast Barbara! This has been fun. Barbara Currier: Oh, thanks again for having me. I love coming on and talking to you. We'll be back next week with a special episode on R+ 2.0!